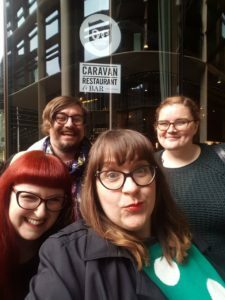 Our autumn Brunch Club adventures continued on Sunday 28th October 2018 at the City branch of Caravan, 22 Bloomberg Arcade, London EC4N 8AR. 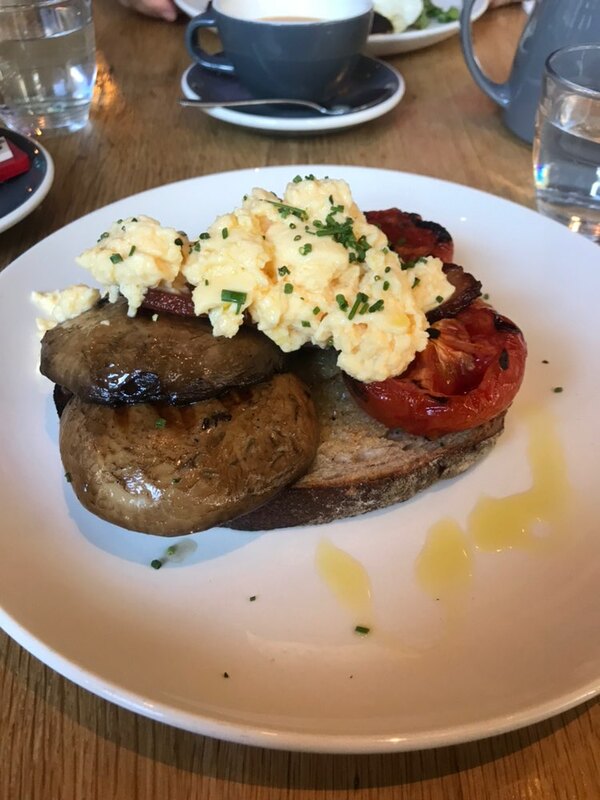 This chain of London restaurants had been on our To Do list for a while and we were all very excited about trying some of the fantastic sounding things on their brunch menu. 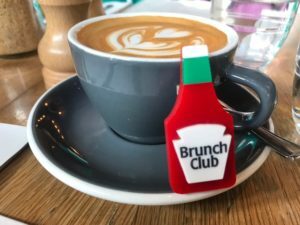 Annoyingly, we couldn’t book at our usual 11am time at the Bankside Caravan, so we decided to go for 10.45 at City (I know, the timing is close enough but we are creatures of habit) and it turned out to be a surprisingly good location for a relaxed weekend brunch. Eleanor: After escaping the ridiculousness of Bank station, I arrived just in time to order a flat white. It was good: strong and milky. 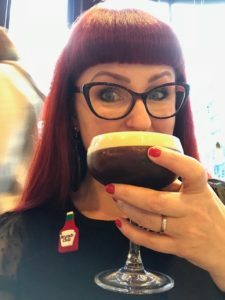 Lori: I was warmly greeted and asked if I wanted a drink as soon as I sat down, so I went for my default order of soya latte and orange juice… before spotting the amazing coffee and drinks menu! At this point, I realised that I was definitely going to need to come back! Lou: I arrived early, and grabbed a lovely carrot, ginger, turmeric and orange juice and a pot of (loose leaf!) English Breakfast which was gorgeous. Ed: I went for the usual English Breakfast, which was a very nice sturdy blend. Eleanor: For my main course I decided to go for the Caravan Fry with scrambled eggs. When it arrived I was a tad disappointed, especially in comparison to how incredible the other dishes looked. I actually googled the menu to check because there was no sausage! There were two large mushrooms, two large tomatoes, one slice of bacon and the egg on a slice of sourdough. It was all tasty but not a “fry” and definitely felt like the wrong balance of vegetables to protein. The bacon looked a bit sad, they should remove it and call a veggie breakfast. Eleanor (cont’d): For brunch pudding, I went for the ricotta polenta hotcakes with stewed plums, maple yogurt cream and pecans. I thought I’d adore this, and the maple yogurt cream and stewed plums were incredible but the ricotta in the hot cakes was not to my taste (I find ricotta bland) as it meant the pancakes were overwhelmed by the ricotta, and (an ever present trend…) there wasn’t enough plums or cream. For a second beverage I tried the passionfruit shrub, the waiter described it as their soda. I had googled “fermented shrub” and it is apparently made with vinegar. It was quite refreshing with an odd salty tang, but too much ice and not enough Passionfruit. 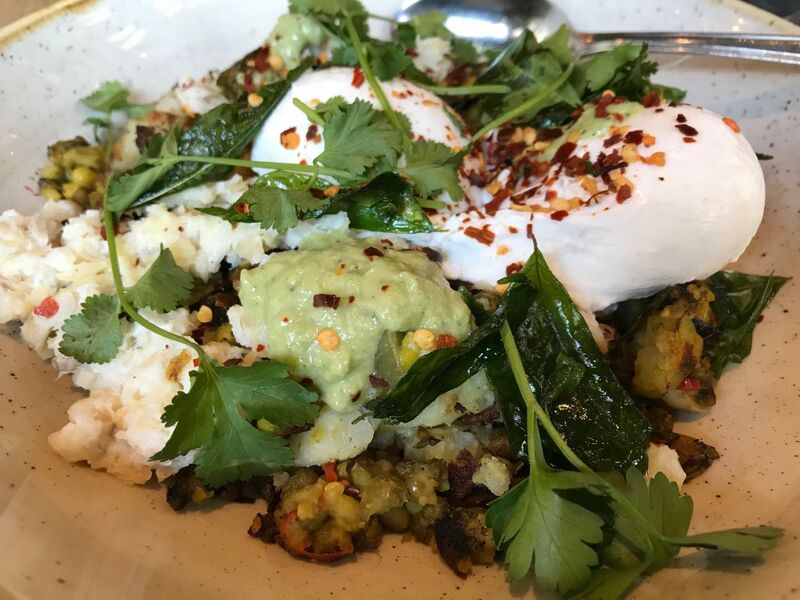 Lori: I went for the crushed potato mung dahl (which comes with spring greens, poached eggs, coconut yoghurt relish, nigella seeds and curry leaves) and added some smoked haddock too. It’s one of those dishes that you read on the menu and then instantly stop reading because you know you have to have that one. It arrived topped with fresh coriander leaves (which I hate), but these were whole rather than chopped so very easy to pick off before I got stuck in. It was definitely one of the best dishes I have ever had at a Brunch Club gathering. Wonderful textures, flavours and left me feeling really satisfied. This meant that I wanted something light for brunch pudding and so veered away from the brunch menu onto the Caravan pudding menu. 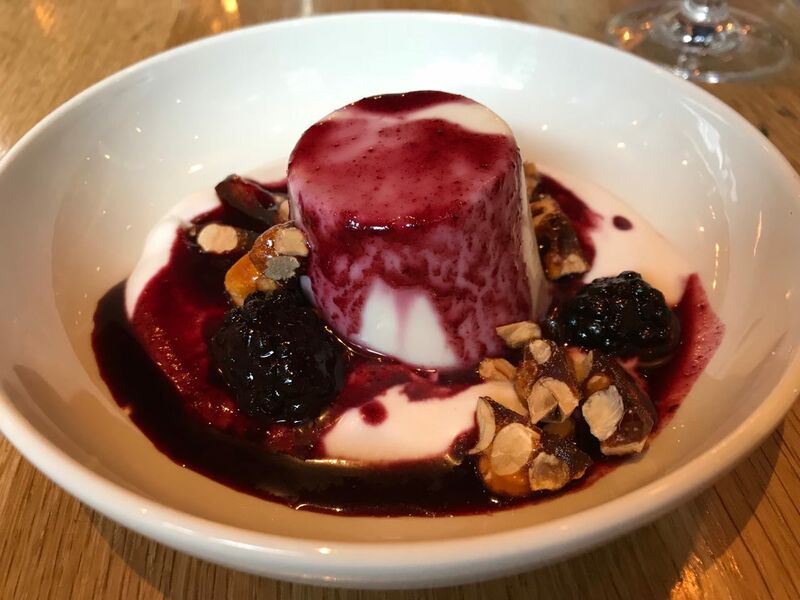 I went for the coconut panna cotta (pretty soon I’ll be an expert on dairy-free panna cotta! ), which came with huge blackberries and tasty hazelnut brittle. 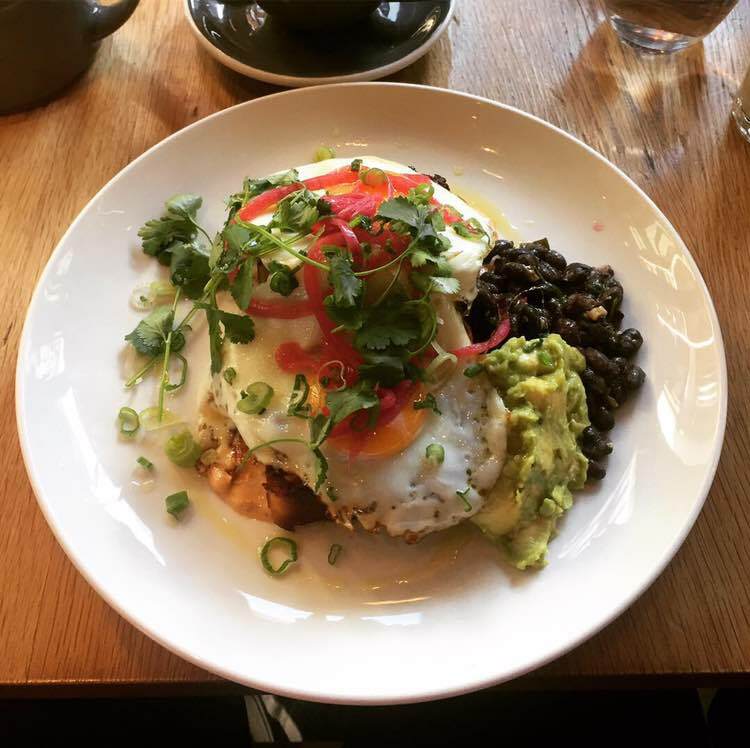 Again, one of my favourite ever Brunch Club dishes… so very fruity and light! 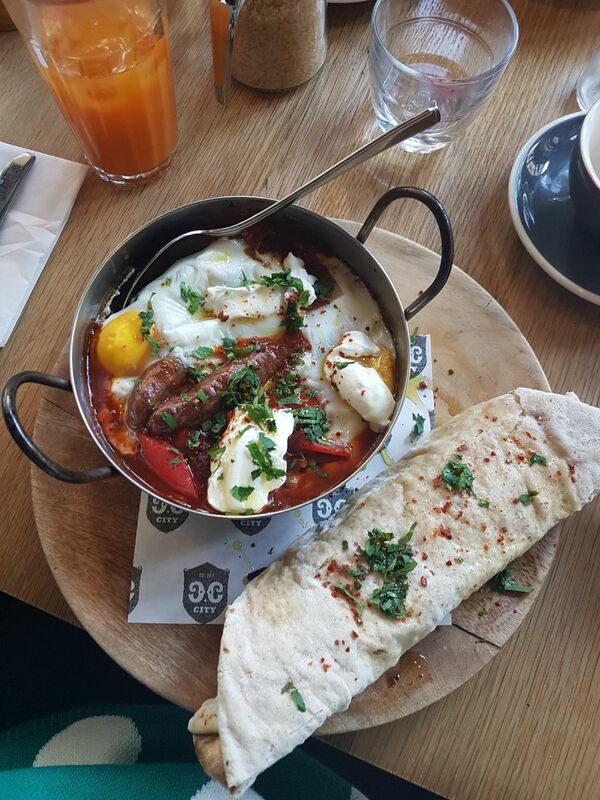 Lou: I opted for baked eggs with added Mezcal sausage which came with a beautiful flatbread. The dish was very tasty with a well seasoned tomato sauce with chickpea and (a lot) of red onion. 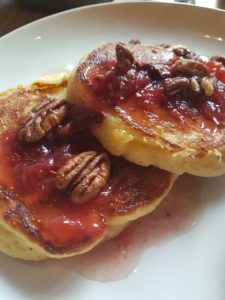 I then opted for a pot of Earl Grey (light and refreshing) and the hotcakes, and loved the combination of the spiced plum sauce with the ricotta. I’m not a huge fan of cream, so the small portion of maple yoghurt cream didn’t bother me (and was lovely) although being served on a *huge* plate it did feel like the dish had room to grow! I thought the dishes were brilliantly presented! Ed: Firstly I had the corn bread with eggs and black bean salsa. It was really delicious and comforting food. There’s something about warm cornbread and how it sort of falls apart a bit as you eat it which is very delicious. 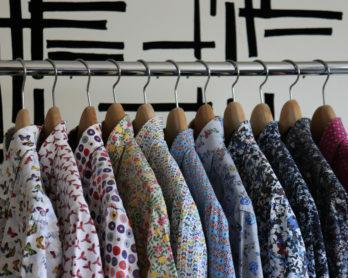 Visually very appealing as well! Once we were given the pudding menu, it was hard to chose as they had a lot of good options. 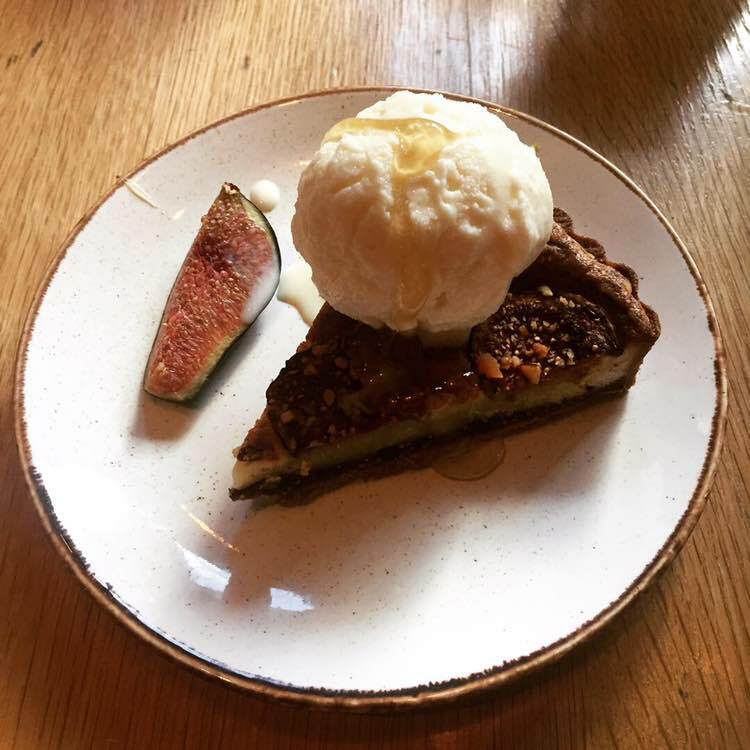 I went for the brazil nut and fig rye tart. This was really delicious and sweet without being overwhelming, the white chocolate sorbet on the side was really delicious too. A good choice! Alongside my teas I had a Banana, Peanut Butter, Date, Cocoa Almond milk blend, which was really great. Nice to see lots of non-alcoholic options on the menu! Eleanor: Drag Race, baths, PhDs, the stunning theatres of London. This was a 3 hour brunch and time flew! Lori: I had been to see Dita Von Teese the night before, so spent a bit of time discussing the show and her appeal. Although her burlesque style might not be my favourite, I love her from a polished ‘old Hollywood’ perspective. She’s the reason I understand the art of glamour. Ed: Work stuff, PhDs, the new development we were in, The Chilling Adventures of Sabrina! Lori: The service was excellent – very friendly and all of the food arrived quickly. As Eleanor said, the room looked quite industrial so I don’t think any of us were expecting how cosy it felt, and the volume was perfect for good chats. Very perplexed by the otherwise brilliant loos having their pretty much identical cubicles gendered though. 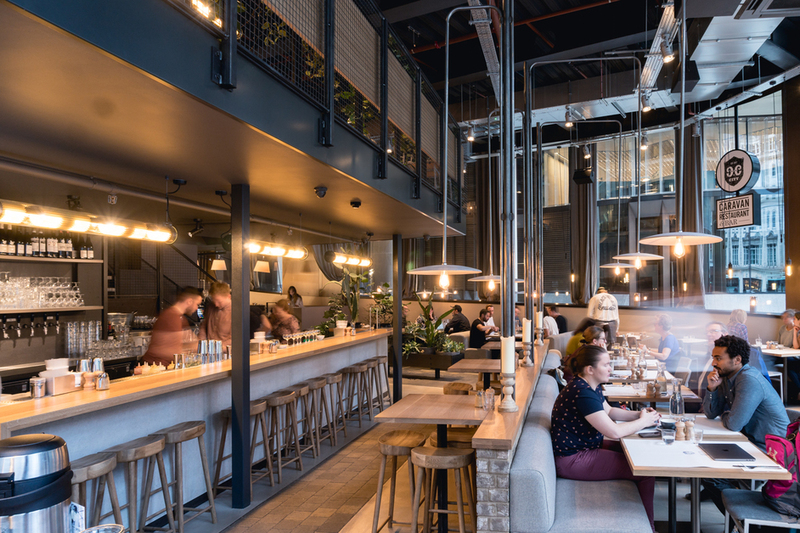 Lou: as the others have said, the service was great, and the entire place felt light, spacious and yet cosy which in the middle of the City on a weekend is no mean feat. I noticed that there was an accessible loo downstairs and there is a step free entrance. The other toilets were up two flights of stairs. Ed: I especially appreciated how upfront the waiting staff were about allergies and intolerances asking us about them when we were ordering, this was clearly something staff were trained to do and it was very reassuring! Atmosphere wise, I was amazed by the acoustics, we could hear each other very well indeed and though there were plenty of other people around it never felt noisy or busy at all. Toilets were pretty standard, it’s nice that we seem to be getting more and more mixed set ups with shared sink areas and stalls “catering” to men and women, even though this is purely because of it saves space, it’s still pleasant not to be shuttled off to an obscure corner of the building whilst everyone else continues the conversation as they’re washing their hands! Eleanor: Lou and I went to the London Mithraeum which was wonderfully interpreted and worth a visit if you’re in the area. Then I was off to work to do a very short dressing shift before heading home for a well earned nap. Lori: I had planned to venture to the Bottle Shop in Bermondsey afterwards, but my sniffles were getting the better of me and so I headed home to put my feet up. Lou: as Eleanor said, we popped into the Mithraeum which was really interesting – after which (and dodging rain showers) I went home, and napped! Ed: Home for shopping and more Sabrina! Eleanor: I’ve wanted to visit a Caravan for ages and the overall atmosphere was exactly what I expected and really quite lovely. I think I made the wrong choices with food and definitely want to go back and try more of the menu. Lori: I was very impressed with Caravan overall and it’s probably going to be my top recommendation out of everywhere we’ve visited so far. (In fact, we discussed doing some Brunch Club awards for our 3rd anniversary next year.) Definitely want to go back and try more of the menu! Lou: I am a huge fan of Caravan restaurants and have been to a few of their branches, whether for evening meals (a combo of tapas style small plates or pizza, alongside a good mix of cocktails and non-alcoholic drinks and coffee), or for brunch or lunch. I really enjoy the atmosphere and the range of options on offer; although I do think Caravan City is probably very different on a weekday. 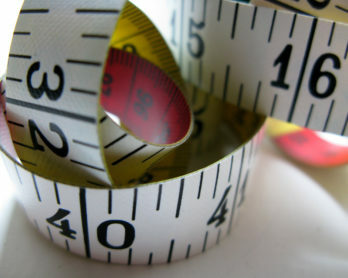 Ed: Overall I was really impressed with the food and the staff at Caravan. It felt informal and friendly whilst also being well-run (a rare mixture!) We didn’t feel rushed or in the way at all. Would like to go to one of the other ones and try the other things on the menu. The one quirk of the menu that bothered me a little was there were no V or VE next to the vegetarian or vegan dishes, which meant I had to read everything, knowing I would only be able to have a small proportion of it. A few times I was interested in something, then I realised it had surprise bacon in! 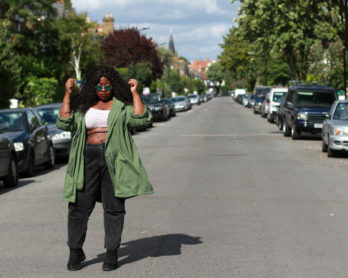 The image at the top of this post is via LondonTown.com. All other images were snapped by Brunch Club members on their phones, so excuse any blurriness as we were all rather excited about eating the food.